By now, everyone has worked with the sincME bar which is the black bar across the top of your screen which allows you to login to the system and shows your access level. We’ve made a couple of important adjustments to this bar. 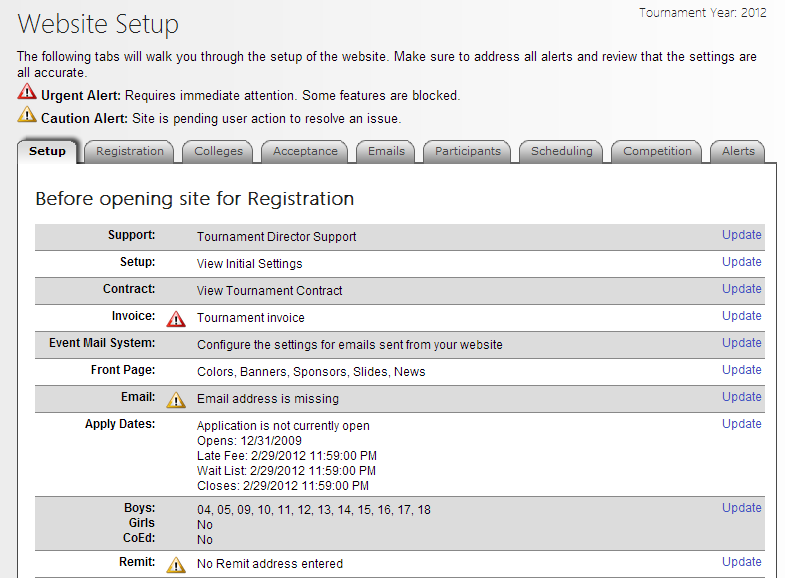 Important alerts for your website will appear on the top menu. Red alerts must be addressed immediately and will cause a pop up to appear on your screen which will take you right to the task needing your attention. Yellow alerts will appear on the top bar so you can click on them and go right to that task. Yellow Alerts include setup items for the website including which ages can register, setting up the fees, entering the primary email address, etc. The top of the website used to consist of 2 separate menu bars which we have just combined into one menu to simply things. All of the items you are used to working with are still listed on the top menu but with a different icon. You can place your mouse over the icons for a description of what it is for. We changed some icons that you’ve worked with on the ADMIN menu so make them more clear to our users. For those clients using the “Red and White” clock icon for scheduling (over 90%) of our clients – there is no change for you. After three years of real time use with “new” scheduling system, we are confident that the system includes all features of the original system in an easier to use package (including new features and screens). The old screens have now been officially retired! If you were using the old screens and are having any difficulty, please contact us so we can give you a personal walk-thru of any part of the process. The “globe” page which is now shown as the “SETUP” page has received some very nice improvements to make it easier to use and follow. Looking at the screen, you will be able to quickly see the current status of most features of your website. Anything that requires your attention will appear with an alert icon next to it so you can make sure to address the most important items right away. Clicking on “Update” will take you right to the task so you can make your changes and get back on your way. Return to the setup screen to view the status and jump right to the next task.